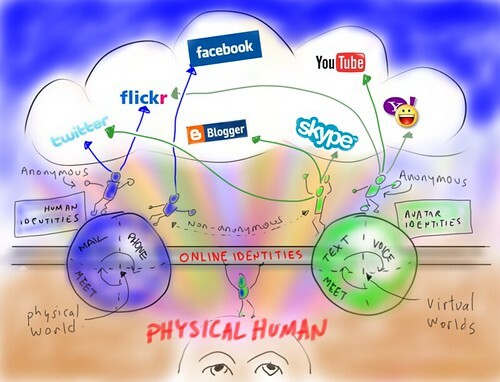 The movement of identity between virtual and physical worlds. In a pervasively networked world, "Think globally. Act locally." takes on new meaning. The network-mediated places where we live, play and work together throughout each day are not geographical, they are virtual. Our communities are not cities and towns, but are platforms such as Twitter, Google+, Facebook, Plurk and Second Life. When an issue of shared concern arises, it makes perfect sense to focus our efforts in the virtual places we live. When we act locally in the virtual space of a social network platform, we also act globally in the physical space of the atomic world. Members of our local virtual communities live all around the plane. The conversations we have and the actions we take spring from multiple continents, time-zones and native languages. To think globally in the virtual sense, our minds must go beyond the platform-specific impact of issues and question their effect on the whole wide worlds, virtual and physical. So the question of Google's "real name" policy is not only about its impact on Google+, but how it relates to the world-wide and multi-platform issue of anonymity and pseudonymity. Although social networks legally are assets owned by corporations, from a human standpoint they are communities in which we live. I believe that some day we will look back on today's virtual communities as Company Towns and extend the rights we enjoy in our physical communities to those we live in virtually.